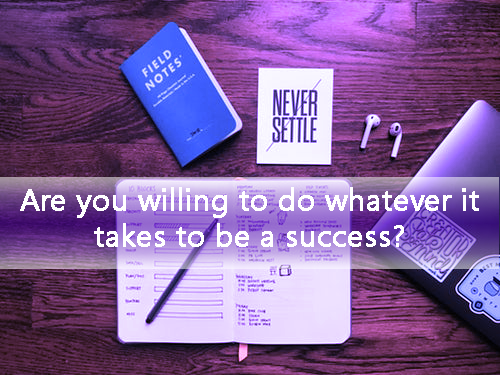 Are you willing to do whatever it takes to Succeed? Are you where you want to be in life? If not, what are you willing to do about it? I recently asked each person in our office to rank their potential on a scale of 1 to 10. Then I asked them to rank where they are in life on a scale of 1 to 10. Every person ranked themselves much higher on potential than where they are in life. The gap between where you are and where you feel you can be is a big motivator. Ask people to focus on that gap, and look to the future as a way of improving performance. After admitting there is a substantial gap between where they are and where they want to be, the next step is to write down their goals. You may be surprised how few people have written goals. Dare them to dream about where they wish to be, and then write those dreams down as SMART goals. SMART goals are Specific, Measurable, Achievable, Relevant, and Time Bound. These goals exercises are necessary, but may not be enough to change performance. Certainly, without focusing on the future, and in the absence of written goals, we are all far less likely to become successful. My question is, how motivated are you to do whatever it takes to become achieve your goals and become a success? Simply put, having dreams and written goals does not ensure you will become a success. Instead, success is assured only when an individual changes his or her mindset and is willing to do whatever it takes to get there. By whatever it takes, of course I mean within all ethical boundaries. I am not talking about hurting other people on your way to the top. The bottom line is that leaders should measure a person by their drive to do whatever it takes, and we should develop that drive and help our team members increase the desire to do whatever it takes to succeed. This desire comes from the inside out. Sometimes that drive is active and simply needs direction from the leader. Other times. it is like a sleeping dragon inside the person, and it is the leader’s job to awaken it. Try this technique. Have each person choose their most important goal and brainstorm until they can write down twenty things they can do to achieve that goal. It may take some time to get twenty, but the person must persevere or ask for some ideas from others until the list is complete. Once they have gotten twenty ideas on how to achieve their goal, they prioritize the list. After ranking and prioritizing the top ideas, ask this most important question: Are you willing to do everything on that list, or are there things on the list you are not willing to do? If they are willing to do everything on that list and begin immediately with the most important, they will soon find not everything on the list will need to be done in order to achieve the goal. Instead, it is the willingness to do anything and everything on that list that allows them to become a success. If the person is only willing to do certain things but not other things on the list, they will never succeed. In the end, only those willing to sacrifice doing what is difficult, coming out of their comfort zone, and showing the discipline necessary to succeed are those who will succeed. If, there is any sort of excuse or reasons why they don’t want to sacrifice, success is not in that person’s grasp. In order to succeed in life as an individual, or in order to run a successful team, ask are you willing to do whatever it takes in order to succeed? If not, change your mindset, change your goals, or change the people on your team.